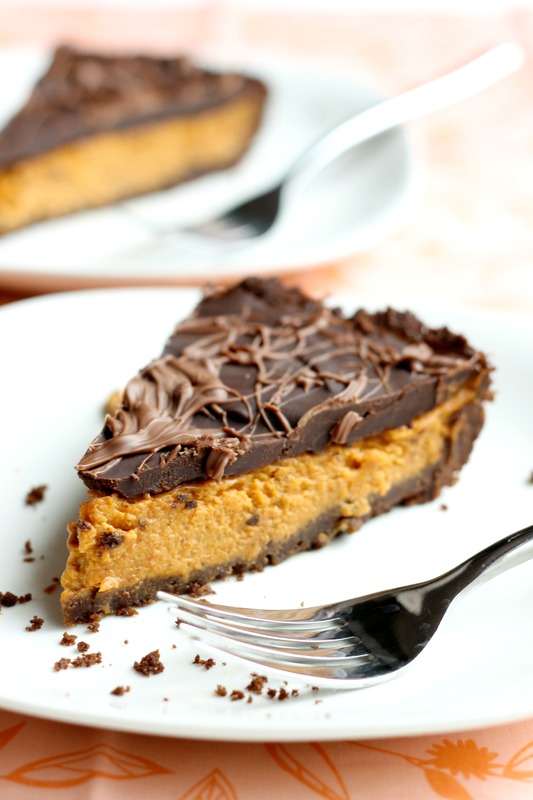 Therefore, I give you Chocolate Pumpkin Pie. Yes, you still get the pumpkin flavor with the bonus of chocolate. You’re giving a nod to tradition, but just turning it up to level awesome. 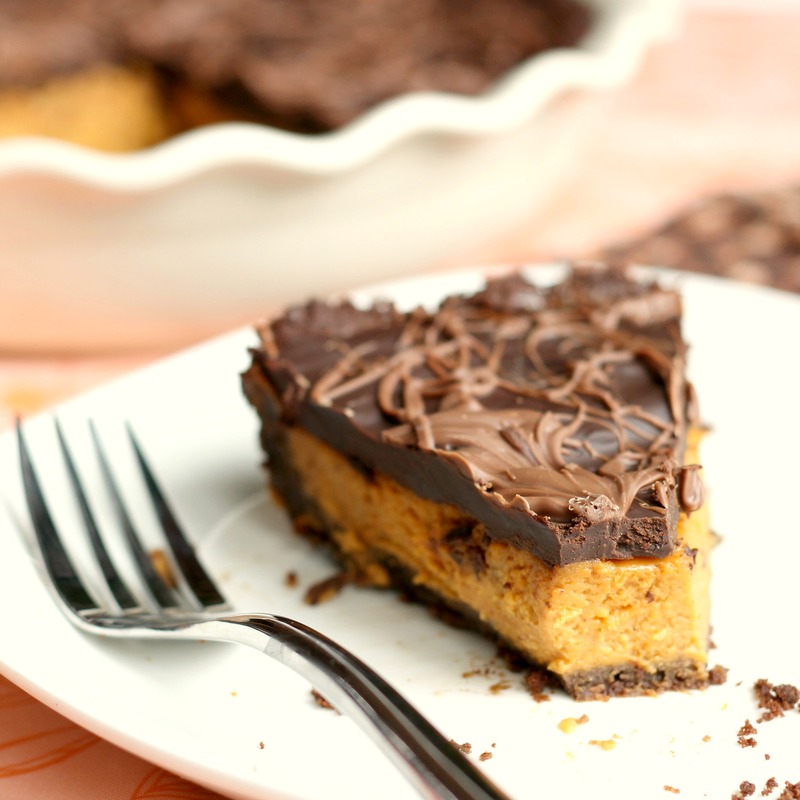 Pumpkin is the first flavor you notice on your tongue, followed by the lingering silkiness of the chocolate ganache. Mmmm…. And a quick side note. The ganache is harder than the creamy pumpkin custard in the middle. For easier eating, flip the slice of pie upside-down. I know it sounds crazy, but it works! In a food processor, grind your chocolate graham crackers with the brown sugar and instant espresso. Pour the melted butter over the mixture, and process until it looks like wet dirt. Pour the crust into a 9 or 10 inch pie dish. Using your fist, press the crumbs into the pie dish and up the sides until you have an even crust. Bake for 10 minutes. Set aside to cool. Turn oven down to 325 degrees. In a large bowl, whisk together the pumpkin, evaporated milk, brown sugar, eggs, corn starch, salt, vanilla, cinnamon, ginger, nutmeg, and cloves. Pour the custard into your pie crust, and bake for an hour. The middle of the pie should still wiggle some when you pull it out of the oven. Cool to room temperature. Melt dark chocolate with the heavy cream in a heat-proof bowl placed over a pot of simmering water. When it is smooth and shiny, pour over the pumpkin pie and refrigerate until set. 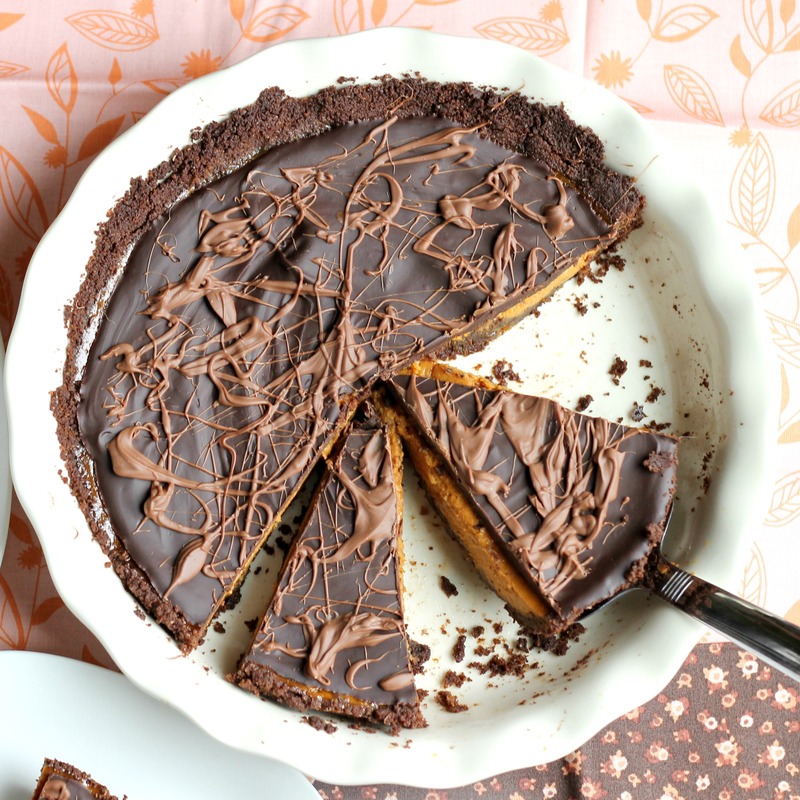 Melt your milk chocolate and drizzle onto the pie. Refrigerate for 8 hours or overnight. Yay for make-ahead pies! Serve the pie chilled or else the pumpkin custard will become too soft and squish out the sides when you’re trying to cut the pie. 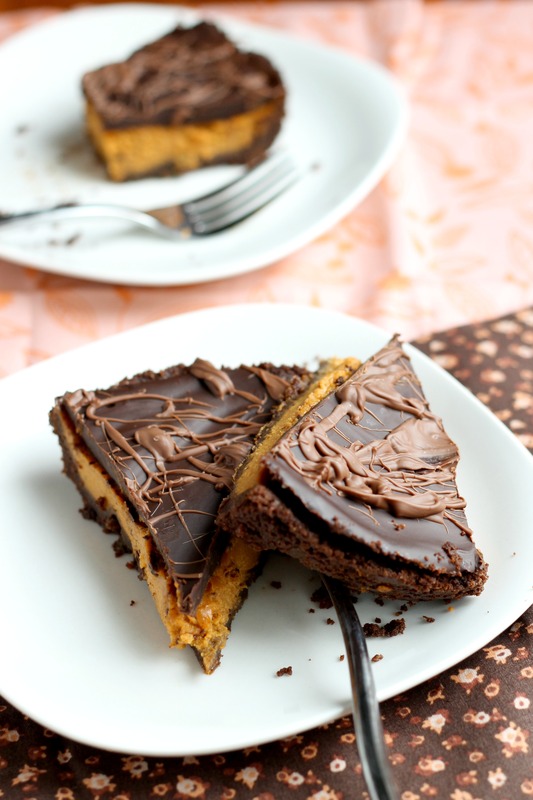 Cut your pie with a sharp knife that has been rinsed under hot water so it glides easily through the chocolate ganache. Bask in the spotlight as your friends and family swoon over your homemade pie. Whoa, new camera!!! WHOA! See what you mean about the pics. . .gorgeous! Jen, I can’t tell you how much fun I’m having with my new camera! Thanks for the compliment.